Congratulations to all our First, Second and Third Year students on the occasion of their prize giving ceremony today. We wish them the best of luck in their coming exams. Congratulations to all our Fifth and Sixth Year students on the occasion of their prize giving ceremony today. All the hard work they have done throughout the year is a credit to them and we wish them the best of luck in their coming exams. Fifth years commence their Summer Examinations on Tuesday, May 23rd and the Sixth Years have their Graduation Mass on that night. Congratulations to Margaret Donnelly who has been chosen to represent Ireland at the International Physics Olympiad In Singapore next July. Her selection for this prestigious event follows that of her classmate Moyra Lawrence who will represent Ireland in the International Biology Olympiad in Argentina. Well done to both on their excellent achievement. Are you interested in a class reunion seeing as next year will be TEN YEARS since we left Loreto Balbriggan? The proposed venue for the reunion will be The Bracken Court Hotel in Balbriggan around mid to late May of 2007. This exact date will be confirmed once there is enough demand for the reunion and I have the approximate numbers willing to attend it. If interested, please E-Mail the address below AS SOON AS POSSIBLE with your name and the names of others from our year group DEFINITELY interested, so I can push ahead with the plans. Once the date is confirmed I will forward prices and other details to each and every one of you! Please pass this information on to those in our year group who may not have access to the internet. 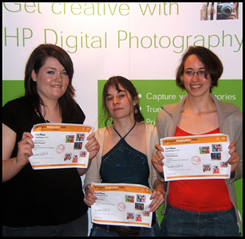 Well done to Fouz Elneihum, Sarah Ahern and Ellen Ronayne for their great success in the HP Digital Imagination 2006 Competition. Fouz and Sarah took first and second prize respectively in the post-primary 17-19 year age category and Ellen took first prize in the post-primary 12-16 year age category. The competition had over 6000 entries from every county in Ireland and with such a large number of entries the girls can be justifiably proud of their achievements. Congratulations. Finally, please take note of the various end of term activities that add so much to the school atmosphere. Thursday, 11th May: Ceol Loreto Gig, 8 p.m.
Tuesday, 16th May: Form & Fusion Show, 7.30 p.m.
Thursday, 18th May: T.Y. Fashion Show, 7.30 p.m.
Thursday, 25th May: Loreto Exams begin for 2nd Year students. Friday, 26th May: Loreto Exams begin for 1st Year students. Monday, 29th May: Transition Year Night, 7.30 p.m. The Junior and Leaving Certificate examinations begin on Wednesday, 7th June. Wishing both yourself and your daughter(s) a happy and successful final term. Congratulations to Moyra Lawrence who has been chosen for the Irish Team for the International Olympiad in Biology in Argentina in July. Well done to Fouz Elneihum, Sarah Ahern and Ellen Ronayne who, have been short listed for the H.P. Photography prize in mid-May. A major fund raising drive for an AstroTurf pitch begins this Friday, 28th April with a school walk. Best of luck to our Transition Years with their production of the musical "Oklahoma". The show runs on Monday, Tuesday, Thursday and Friday, April 3rd, 4th, 6th and 7th. It starts at 7.30 p.m. sharp and tickets costing € 8 for adults and € 5 students, O.A.P's and unwaged will be available on the night. Twenty Transition Year students from Loreto Secondary School, Balbriggan are involved in an exciting and innovative school exchange with the Rural Dublin Leader and Songschool. The project which is 100% funded by Rural Dublin Leader is entitled Project Circus Ceoil and loosely based on the Dr. Seuss Book “If I had a circus”. The 20 students from Loreto and 20 students from Bad Freienwalde will work through the medium of music, dance and circus entertainment skills provided by Songschool and German Circus company, Zirkus Zack. The week will culminate with a finale performance. A video diary of the week will be recorded. The twenty Loreto girls were selected following a written application and interview. It is hoped that the project will provide educational experience and learning activities in performance, event management, video and video editing. Students from Balbriggan will be accompanied by Phil Moore of Rural Dublin Leader, Peter Baxter and Chris Teusner from Songschool and three teachers, Ms. McHugh, Ms. McCartan and Ms. O’Keefe. It is an exciting and learning opportunity with great potential. Congratulations to the U-16 Gaelic Team who have reached the Dublin Semi-Finals. Congratulations to Christine Byrne (4th Year) who has been placed on the U-17 Irish panel for the upcoming soccer international. Mr. Kilgarriff & Ms. Bailey, along with sixth years, Carolyn Kelly, Fouz Elneihum and Catherine Geaney are making a presentation on Friday, 31st March to the E.S.A.I. - The Educational Studies Association of Ireland in N.C.A.D. The conference is a prestigious event with seminars being presented by educational researchers on a variety of topics. The Loreto teachers and students are presenting the findings and conclusions from their "Opening the Corners" exhibition created by last years 5th Year Art students in conjunction with N.C.A.D. and I.M.M.A. (Irish Museum of Modern Art). The exhibition was part of an overall attempt to modernise the current Leaving Certificate syllabus and will be shown in N.C.A.D. during the conference. This is a great opportunity for both teachers and pupils to present their work to this important and influential conference. Well done to the four students who participated in the Loreto Senior Mace Competition on Tuesday, 21st March. Kate O'Keeffe and Saibh McDonough-Kelly reached the quarter finals while Maeve Mulligan and Sarah Callaghan reached the Semi-finals. Well done to the three hockey teams who reached their respective finals at ALSAA on Wednesday, 22nd March. Unfortunately, each side were narrowly beaten. Best wishes to 2nd Year student, Aine Garland who competed in the All Ireland Long Jump Championship in Tipperary on Saturday, 26th March. Best wishes to all students involved in Oral French, Irish and German at Leaving Certificate level between 22nd March and 7th April. Those taking practical Home Economics and Music are also wished the best. The Transition Years are rehearsing intensely for their presentation of "Oklahoma". This, the 12th Musical in succession, is scheduled for the week beginning 3rd April. Tickets can be booked by telephoning the school. Well done to Sarah Callaghan who represented the school in the Loreto Senior Public Speaking Competition on 15th March. Loreto Crumlin won the competition. The Junior A side will play off against Mount Temple on Monday, 20th. The Minor A have a play-off against Wilsons Hospital on Tuesday, 21st. Best wishes and congratulations to the team and their coaches, Ms. Maglicco and Ms. O'Neill. Congratulations to Caroline Walsh (2nd Year) who won a keenly contested Loreto Junior Public Speaking Competition. The title of Caroline's piece was "What gives me Hope". Caroline was complimented on her eloquence, intelligence and focused speech. Congratulations to three sixth year Science students who had great success at the recent All-Ireland Science Olympiads in Dublin City University. 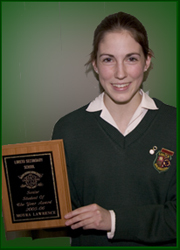 Moyra Lawrence won the gold medal in the Biology Olympiad. She was one of some 150 finalists and is now a member of the panel of 10, 5 of whom will be chosen for the International Biology Olympiad in Argentina. 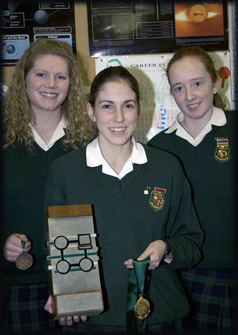 Margaret Donnelly won the Bronze Medal in the Physics Olympiad and is on the panel of 10, 5 of whom will be chosen for the International finals in Singapore. Aisling Rooney was highly commended and won a place on the panel of ten in the Chemistry Olympiad. Five of these students will be chosen for the International Olympiad in Korea. The school had been involved in excellent tours to Germany, Florence and Paris in recent months. However, an especially interesting trip will occur over Easter. It is a circus skills exchange. A group of 20 girls from Loreto, Balbriggan are sponsored by Rural Dublin Leader to work with a school just outside Berlin on circus performance skills. This will be achieved through workshops and master classes. There will be a performance in an actual Big Top at the end of the week. The local Songschool Music Centre along with teachers from the school will accompany the girls. The Young Social Innovators Group has a long and successful history in the school. Two years ago the school won the overall prize with a project based on the Mosney Refugee Centre. While last year the group with a project on Mothers in Mountjoy won the Communications Award. This year’s group, working with Michelle Briscoe, have a fascinating project – “Laughter is the Best Medicine” and is based on research on Clown Doctors and the beneficial effects of laughter for sick children. As part of the project, the students have been on the City Jet Santa Flight for sick children, made a laughter C.D. and visited children’s hospitals. There will be a reunion of the class of '81 in The Old Mill, Julianstown on March 4th at 8 p.m. Further informaton may be obtained from Linda Donnelly. Thurs. 22nd Dec. First class followed by the Christmas Concert. Students have a half day. Supervised Study will recommence on January 9th. School will end at 12.40 on Tuesday, January 17th for a staff in-service on Children First - Child Protection Guidelines. Congratulations to the students who performed in the Helix with the Dublin Secondary schoolgirls Choir. Congratulations to students and teachers on the recent wonderful Art Exhibition. Well done to outgoing Sixth Years who attained Entrance Awards to Trinity and U.C.D. Congratulations to all involved in French, English, Irish and German debates. Well done to Kerry Cahill and Laura Boylan who came third in the Schoolgirls East of Ireland Golf Championships in Clontarf. Laura plays her golf in Skerries, while Kerry plays in Laytown. Best wishes to the 120 Transition Years and their teachers who are spending a week in the Delphi Adventure Centre. Registration for incoming First Years, September 2006 is on Wednesday, 28th September, 2 -4 p.m. and 7 - 8 p.m.
An evening for First Year Parents to inform them of how their daughters have settled and the R.S.E. programme will be held on Wednesday, 19th October. Congratulations to the following past pupils who had recent successes. Elizabeth Seaver who launched her new CD in the Millbank Theatre on Sunday, 18th September. Ciara Durkan who represented Dublin in the All Ireland Junior Camogie Final on Sunday, 18th July. Congratulations also to a present Sixth Year student Elizabeth O'Hagan. Elizabeth won awards in the All Ireland Tetrathlon competition and also in a Junior Pentathlon competition in Portugal. 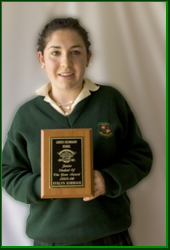 Elizabeth also represented Ireland in the Junior International Shooting Championship in London.